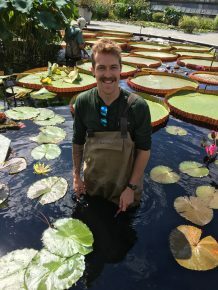 With financial assistance from the RHS bursary scheme and the Great Dixter Christopher Lloyd bursary, David was able to travel to and spend two weeks working at the famous Longwood Gardens in Philadelphia. An excellently varied itinerary saw him work all over the 1000 acres of gardens on offer, including working in the Lily ponds removing and cleaning Victoria amazonica leaves, working in the vegetable garden, the meadows, the water fountain garden and in the incredible glasshouses where David spent most of his first week. Amongst a wide variety of activities, David worked on planting up globe-shaped baskets and re-potting Orchids.